Valentina is a Steinway & Sons™ listed Music & Piano Teacher; Steinway have also provided performance sponsorship. Valentina teaches in the style of the renowned "Russian School of Music" - which she of course was brought up in herself - as are all of her qualifications. Here, in the U.K., the curricula of ABRSM, Trinity, etc. are followed. 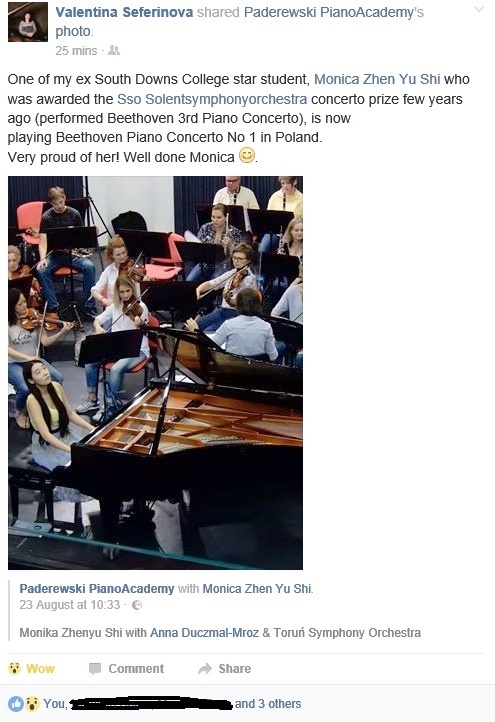 Valentina teaches students at all levels - from beginners (but prefers students to have already achieved Grade 5 - see below) through to Grade 8; and on to the professional levels of Diploma, Licentiate, Associate, Fellowship &/or Bachelor and Master Degree level - both in piano performance and/or music theory. Within the last 16 years, here in the UK, students from Grade 1 to Licentiate Level have been successful. See panel below for information on UCAS points for University/Conservatoire entry requirements - but alway check for latest information from UCAS directly. Royal Academy of Music; Royal College of Music-London; Guildhall-London; Royal Northern College of Music-Manchester; Royal Welsh College of Music & Drama-Cardiff; Birmingham Conservatoire; King's College-London; Trinity College of Music-London; Goldsmiths-University of London; Royal Holloway-London; London College of Music; University's of Aberystwyth, Bangor, Bath Spa, Birmingham, Chichester, Hertfordshire, Keele, Lancaster, Newcastle, Nottingham, Oxford, Plymouth, Southampton, Sussex, York, Sussex, etc. Students have also been accepted for the Royal Marines Band Service. Students have won scholarships/bursaries/general entry to Peter Symonds College, Winchester College, Harrow Public School, Portsmouth Grammar School, Churcher’s College-Petersfield. Former students have gained employment at The Royal Academy of Music, London; West End shows, etc. Generally Grade 5 and above, including A, AS level, students are taught at The South Downs College, Waterlooville/Havant - where she is a Lecturer. She is also engaged as a member of the 'Visiting Academic Staff' at Churcher's College, Petersfield, as 'Visiting Piano Teacher'. Students may also be taught at Valentina's home address, in her own Music Room, subject to private arrangements. And, for your peace of mind, wherever and however Valentina teaches - she is fully screened for involvement with children/minors/young adults, and others judged to be of a 'vulnerable disposition', and by CRO/CRB/DBS (formerly known as 'CRB check') clearance. Valentina is also able to offer all protections available to students as provided to her as a member of the Musician’s Union. Should you need more information please use the 'Contact ...' page. Valentina is also available for Master Class sessions - either publicly or privately. For beginners &/or younger students - please see the panel(s) below. Well done to ALL South Downs College music students in their AS & A Level results this year! In A Level performance module - 7 A (with 2 top marks!) & 6 B.
Valentina is available for accompaniment of students of all instruments taking grade exams, course assessments at higher education colleges, etc., by private arrangement. 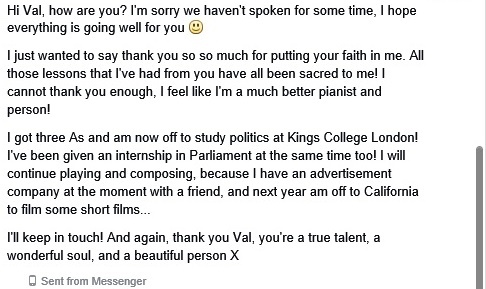 Valentina is also available as an accompanist at music competitions, festivals, and professional engagements, etc. for musicians of all genres. If unavailable by prior engagement, or circumstances, then Valentina is able to recommend one or more of her senior students to fulfil your needs. Please contact her in the first instance to discuss. Did you know that you gain University Entry (UCAS Tariff) points? UCAS Tariff/Points Recommendations for applications from Sept. 2016 onwards. *Points shown are for the ABRSM, RSL, TCL and UWLQ Advanced Level music examinations. This also includes the Level 3 Certificate in Music Production Grades 8, 7 and 6. These Tariff points are used for applications submitted for the 2017 admissions cycle onwards (i.e. for students making applications from September 2016 for full-time courses starting from September 2017). please contact her directly to find out. - a former student of mine. Jack Davies - B.Mus (Hons.) R.N.C.o.M. also piano and music theory teaching in Oxford and surrounding areas.